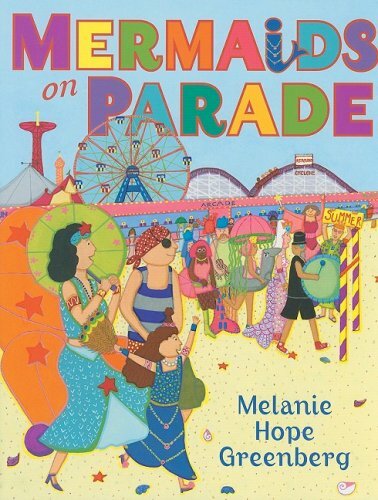 So I met children’s book author and illustrator Melanie Hope Greenberg last year at Book Expo in New York and quickly discovered that not only is she a bona fide mermaid but that she even wrote and illustrated a book about Coney Island’s Mermaid Parade. Which seems to me about the best thing you can write about, when it comes down to it. What better thing to show children than that you can actually dress as a mermaid and march in a parade at Coney Island? Melanie marches in the parade herself as well – though marching might not technically be the right word for what a mermaid does – as part of the Superfine Dinettes, which seems only right. 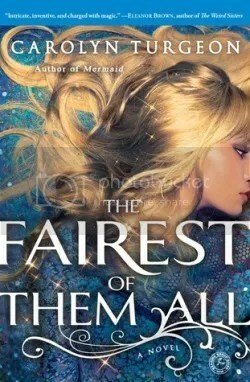 Obviously, I was obliged to ask her about her book and the parade and mermaidliness in general. Here is our Q and A. So what inspired you to write Mermaids on Parade? And have you written about mermaids or Coney Island before? 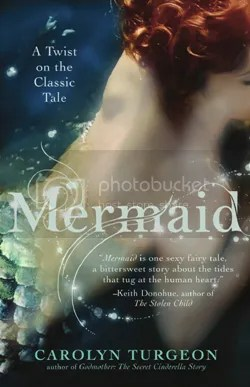 This was my first book about Coney Island and mermaids. Mermaids on Parade was an idea which grew out of community. In 2005, Brooklyn librarians told me what was missing on their bookshelf and how Brooklyn children need to see themselves to get excited about reading. Three months later, Tanya Rynd, who owns Superfine in Dumbo Brooklyn, invited me to join her performance art troupe. 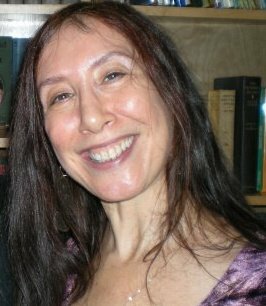 Her Superfine Dinettes would be marching in the upcoming Coney Island Mermaid Parade. I enjoy omens and synchronicity. Have you always known you were a part mermaid? I think many people feel a bit mermaid. Mermaids bring up myths from ancient days. Mermaids bring up the mystery within our psyches, the sense of child-like wonder that we use when we write, paint and make art, even if not about mermaids. For those reasons a mermaid has always intrigued me. What is the best thing about transforming into a mermaid, in your opinion? Mermaid is more symbolic. I am a mermaid even in casual clothes. For me, a mermaid represents beauty, glamor, mystery, legends, power, and shape shifting into another time, another world, a whole new body. Her symbol helps me tap into the wonder children feel as they experience each day, a new world of varied things to explore. Symbols help to transcend the mind and launch us straight into the heart and imagination. At the Mermaid Parade I can manifest these ideas into a costume. 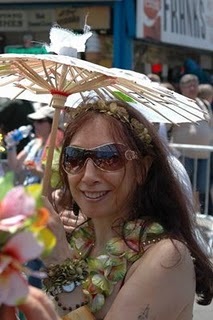 How long have you participated in the Mermaid Parade? I marched in the parade as a Superfine Dinette from 2005- 2009. I watched it from the audience point of view in 2010. It’s much more fun to participate. Each year the Dinettes created a brand new theme with a performance and costumes which we created at the “Tail Factory”. We’ve been the MerMod Squad, Ladies Mermalade, MerMades in the Shade, and the Hip Hop Hulas. We won the silver medal in 2009 as the Roller Coaster of Love. At Coney Island, the current parade route has gotten so big and popular it has expanded way past the map I illustrated in my book. It is the largest art parade in the United States. How have children responded to your mermaids? And adults? Children love color, festivities, shiny things, amusement parks and spontaneous fun. It is a Win/Win with children, both boys and girls. Men and women embrace the mermaid symbolism and love Coney Island, so that too is a Win/Win! How would you describe the appeal of mermaids? The half creature-half human mermaid seems to bridge the gap between beauty and power. A connection that happily seems to not create frictions or power plays amongst opposite genders. Adults, I believe, love mermaids because mythical creatures bring us back inside to our own mystery and child-like sense of wonder about our place in the universe. Children live in that mysterious realm of wonder so relate to mermaid symbolism easily. And do you have any advice for aspiring mermaids? Be yourself in and out of a costume. Find that mystery inside that makes you feel unique, powerful, beautiful, wonderous, and then express it to the world. Shake that tail feather! Far Shore! Here is where people can buy the out of print mermaid book. Hi there! I’m so glad I found this blog. My name means ‘mermaid’ in tagalog (I’m half Filipina) & I’ve always felt a deep connection to the sea, so I am so happy to have found many kindred spirits in this blog!